When a man named Charles Sumner Ward came to London for a few weeks in 1912, he intended to cause a splash and succeeded in doing so. Sumner Ward was in town to raise £100,000 for the local YMCA, using a ‘short period’ fundraising technique he had perfected in his native United States. His idea was to create a publicity whirlwind that would be capitalised upon instantaneously. In the course of 12 days, nobody would be able to escape the campaign – not the wealthy businessmen who Sumner Ward would clinically target with appeals, not the shoppers who would see electrically-lit cash totalisers arranged around central London, and certainly not anyone who read a newspaper. It worked. Sumner Ward didn’t quite hit his target, but £66,000 was a pretty decent effort for under a fortnight’s work. Sections of the British press swooned before the American’s flashy and effective campaign, impressed by his ‘novel outlook on the business side of philanthropy’. 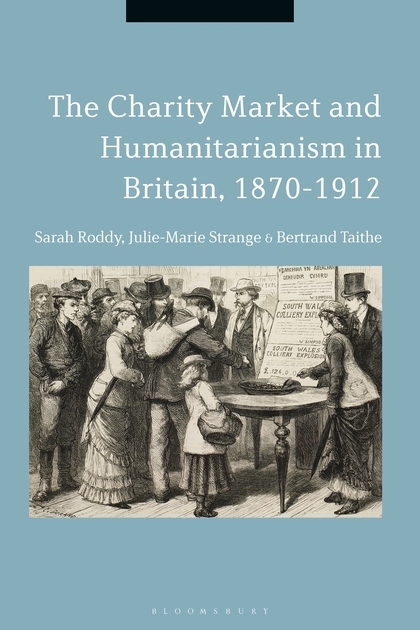 But, as our book The Charity Market and Humanitarianism in Britain, 1870-1912 shows, this praise was deeply unfair on the existing charity sector in Britain. For by the time Sumner Ward turned up, there had been at least 40 years of endless innovation in British charity fundraising, and Britain had produced a raft of what we term ‘charity entrepreneurs’ who were every bit as astute as the American when it came to ‘the business side of philanthropy’. These entrepreneurs include names both still famous and now long forgotten: among them, General William Booth of the Salvation Army, Thomas Barnardo, Alfred Alsop (of Manchester’s Wood Street Mission), H. Lee Jones (of Liverpool’s League of Welldoers), and Angela Burdett Coutts, Lady Strangford, and Paulina Irby, the latter three each stout fundraisers for multiple causes related to overseas wars. Their success was based, broadly, on three key factors. First, each had a readiness to adopt new technologies and harness them for raising money almost as soon as they became available. Most obviously, General Booth was quick to use both the ‘graphophone’ and the motor car in his fundraising campaigns. Thomas Barnardo and Alfred Alsop were notable pioneers in using mass cheap print, churning out magazines, pamphlets and ever-popular ‘waif stories’ by the tens of thousands. And all charity entrepreneurs seem to have caught on to the emergence of a mass consumer society with stunning alacrity, and found clever ways to ensure that charity donations became a logical part of people’s increased discretionary spending. Marketing, branding and public relations became enmeshed in the charity world long before some of us may think. Second, charity entrepreneurs were nimble enough to adapt their messages for different audiences, or, as we more precisely term them in the book, ‘donor markets’. Children and working-class men and women, who were not traditional targets for charity fundraisers, might only manage to give small amounts as individuals, but as part of the crowd these contributions soon added up. Mass, flexible messaging – of the now-familiar kind that specified what different sizes of donations could help the charity do – became common in this period and allowed an increase to the social depth of charities’ donor bases. Finally, charity entrepreneurship was infectious. Not only did the likes of Booth and Barnardo endlessly encourage innovation from below in their organisations – through in-house publications that circulated fundraising best practice (e.g. the Salvation Army’s ‘The Officer’ magazine), and membership schemes that rewarded the best fundraisers (e.g. Barnardo’s ‘Young Helper’s League’), but, through their obvious success, they encouraged the same innovation across the sector. Among other long-term organisations that tackled poverty, but also in more ad hoc funds set up to respond to disasters – many coming under the Lord Mayor of London’s Mansion House franchise – novelty became a watchword for those who gathered the money. A key example comes in the image we have used on the front cover of the book. ‘Simpson’s bowl’, popped up on the Liverpool docks in the wake of large disasters, both national and international, and was ostensibly just a collecting box like any other. But it had all the hallmarks of a brand, and a highly lucrative one at that. Others would try to replicate its success. Competition between charities could therefore be fierce, as we show, and it very much played into how the sector conducted its own self-regulation in the period, demanding new mechanisms of accountability that could reassure donors that their money would be managed properly. But competition also bred further innovation, which in turn ensured that the charity market expanded greatly in the decades before 1912. In that context, to claim Charles Sumner Ward as a ‘father of modern fundraising’, as some do, ignores the fact that, as our book argues, fundraising was being perfected and professionalised in Britain long before he hit these shores. About the Author: Dr Sarah Roddy is Lecturer in Modern Irish History at the University of Manchester. She is the author of Population, Providence and Empire: The Churches and Emigration from Nineteenth-Century Ireland (Manchester University Press, 2014) and, with co-authors Julie-Marie Strange and Bertrand Taithe, The Charity Market and Humanitarianism in Britain, 1870–1912 (Bloomsbury, 2018).